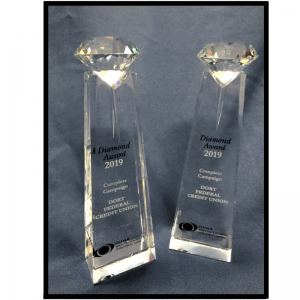 Grand Blanc, Michigan – Dort Federal Credit Union was recently honored with two Diamond Awards, which recognizes outstanding marketing and business development achievements in the credit union industry. Dort Federal Credit Union won the Complete Campaign category for two entries, one entitled Boost Checking and their Every Step You Take. The Boost Checking campaign advertised Dort Federal’s high interest checking account and Every Step You Take is a brand awareness campaign. Award winners were recognized at the council’s 26th annual conference held March 20-23 in Las Vegas. For more information on the Diamond Awards or to view the entire list of winners, visit here.